Interoperability in health care is all the rage now. After publishing a ten year interoperability plan, which according to the Federal Trade Commission (FTC) is well position to protect us from wanton market competition and heretic innovations, the Office of the National Coordinator for Health Information Technology (ONC) published the obligatory J'accuse report on information blocking, chockfull of vague anecdotal innuendos and not much else. Nowadays, every health care conversation with every expert, every representative, every lobbyist and every stakeholder, is bound to turn to the lamentable lack of interoperability, which is single handedly responsible for killing people, escalating costs of care, physician burnout, poverty, inequality, disparities, and whatever else seems inadequate in our Babylonian health care system. According to OECD data, Americans see doctors less frequently than people in any developed nation. We are hospitalized less frequently and we stay in the hospital less time than citizens of other nations. The vast majority of Americans, more than any other nation, describe themselves as healthy, and America has the largest percentage of young people in its population. So why is health care in America so much more expensive than it is in all those other developed countries? In the US, we spend more than twice as much as the nearest nation on administrative activities (over $200 billion per year). We also pay a lot more for each hospital stay, in spite of it being shorter. We pay orders of magnitude more for each imaging test and we are paying a hefty price for medications we probably shouldn’t be taking. All of these things amount to one major difference between America and the (largely socialist) developed nations: our unit pricing for medical services is completely out of whack. Ignoring simple math, the government of the United States in cahoots with insurance companies, and a host of other global business interests, is hell bent on having Americans use even less medical services than the modest amounts they are currently using. This may be medically questionable, but one could see how overall health care expenditures could be reduced, if and only if, unit prices were held constant. To the certain dismay of every fourth grader learning how to multiply big numbers, the government is simultaneously encouraging unprecedented increases in unit prices. By promulgating a flurry of complex regulations, the government is eliminating all small and lean medical facilities in favor of large quasi monopolistic entities able and willing to raise unit prices at will. On an individual business level these health care conglomerates are also seeing healthy increases in service volumes, driven by mass destruction of their competitors. Higher unit prices coupled with higher volume is a sure recipe for higher profits, even when discounting for extra costs of compliance with regulations, and decreased utilization on a personal patient level. Health insurers couldn’t care less about the allocation between volume and unit price, as long as total expenditures remain the same, or the increase is covered by taxpayer largesse and/or individual out of pocket responsibilities. The net result is that when you buy fewer tomatoes, but you buy them all at the one mega store, and pay twice as much for each tomato, you get less tomatoes and the mega store gets more money. Since greed has no boundaries, maybe we can substitute ketchup for your tomatoes? 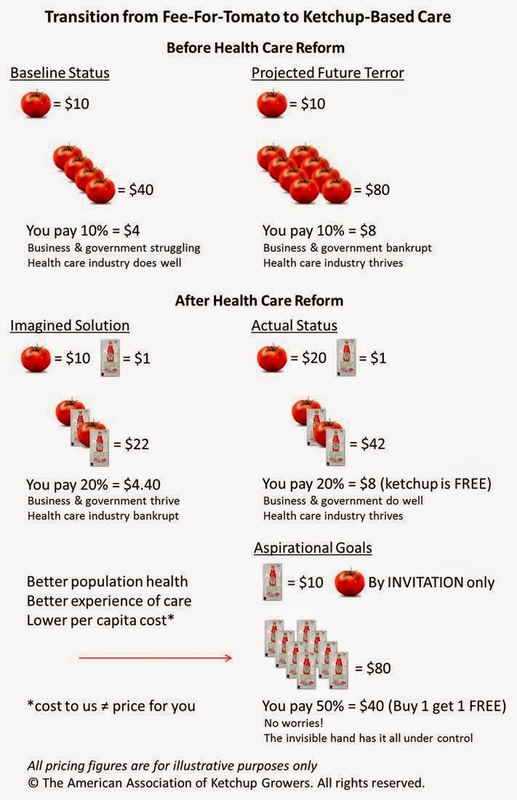 Herein lays the value in value-based utilization of medical services, or tomatoes, because bait and switch is an honorable and time tested business model. There is however a minor problem. What if the cashier refuses to cooperate and walks out? This of course is what thwarted value-based extraction of wealth in the nineties. Somehow, things seem different now. People are becoming increasingly convinced that ketchup is just a more convenient form of tomatoes, while doctors are increasingly willing to peddle Heinz and none more so than primary care physicians. At one time all care was direct and most care was primary care. You called the doctor, he came to your house, did whatever he did, and before he left you gave him some sort of payment for his services, directly from your hand to his hand. If you had nothing to give, you went without, or relied on the doctor’s charitable nature, if he had one. Later on, you obtained health insurance, and you could send the receipt from your doctor to your insurer, and the insurer would reimburse you for all or part of the money you paid your doctor. Today, you sign a form to reassign your health insurance reimbursement to your doctor and let the two of them duke it out over proper reimbursements. A few decades ago, representatives of all doctors got together and recommended to the government, the largest health insurance payer in the country, that primary care work is essentially worthless. The government and all other insurers agreed. A few disenchanted primary care doctors decided to bypass this unfair (to them) system and opened little concierge practices, where they charged what they believed their services are worth and where the patients paid directly to the physician owner. Just like an expert cupcake maker does not open a little bakery store to solve world hunger problems, these concierge docs never presumed that what they do is a solution for the national health care fiasco. They are small business owners who want to make a decent living by doing something they love doing, and are presumably very good at. As is usually the case, some people figured out how to monetize this disenchantment with the system. Today, the direct primary care (DPC) moniker has been hijacked by a more ambitious business proposition. Establishments calling themselves DPC today are usually founded by entrepreneurial primary care physicians with the explicit goal of creating national chains of primary care clinics where practicing doctors are employees or franchise managers, like Starbucks or McDonald’s. DPC chains charge subscription fees hovering around $1,000 per patient per year regardless of utilization. This is significantly more than a primary care physician is paid by the typical mix of insurance plans. In return for the higher unit price, DPC chains promise to provide superior services, better doctors, higher availability, longer visits, and a host of ancillary benefits ranging from Skype visits to personal trainers (Tomatoes). The DPC chains were never intended to be truly direct pay practices, but they did purport to offer doctors who were too frightened to hang out their own shingle, another way to practice medicine free of micromanaging insurers. That didn’t last long, because most health care money (public and private) is controlled by health plans, and because venture capital is not in the habit of forgoing its obscene and customary returns on investment. Hence, these venture capital funded DPC chains are actively seeking and some already have contracts with the same evil health insurance companies their employed physicians were trying to avoid. The directness of this model, which was tenuous from the get go, is now practically nonexistent. Since the entire DPC terminology is headed straight down the drain, Todd Hixon, founder and managing partner at New Atlantic Ventures is suggesting a much more accurate definition of this model of primary care: “Population Management Primary Care (PMPC), a new business model based on retainer plus value-based payments to manage a set of customers”. First, “independent payers (health plans, large employers, managed care organizations) will want to work with strong Population Management Primary Care companies to manage their members to good health at affordable cost”. Second, “PMPC providers will need to integrate with retail medicine providers, and also integrate with virtual medicine providers, or become partly virtual themselves”, so they can “equal” the lower pricing of these “other primary care providers” for delivering “low-acuity care more efficiently” (Ketchup). At this point there is not even a sliver of daylight between the old HMO doctor and the brave new PMPC doctor. No worries though, America, because Mr. Hixon, who is actively investing in PMPC companies, is assuring us that “the comfortable, simple primary care of Marcus Welby, MD is long gone, but if Dr. Welby came back and took a look at what is happening, he might like what he sees”. Or he might just hang himself from the first available chandelier. Health care in America is a perfect example of the Pareto principle, because 80% of our gargantuan expenditures on health care are due to only 20% of us who are very sick, elderly, disabled and vulnerable in many other ways. If we genuinely wished to reduce health care expenditures, common sense dictates that we would leave the 80% alone and zero in on those 20%, trying to care for them better than we currently do, and hopefully as their health improves, we would see a spectacular bang for our buck, not to mention the moral gratification of having helped our neighbor, because there but for the grace of God go we all. I have a better idea. 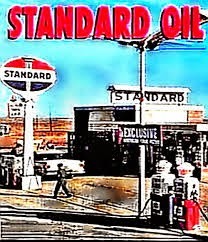 Following the tried and true philosophy of John D. Rockefeller, why not turn the health care disaster into an opportunity to create the magnificent Standard Oil of our times? The 20% of people, who burn through 80% of our $3 trillion of health care money, are known as high-utilizers, frequent-flyers, hot-spotters, train-wrecks, million-dollar-babies, and all sorts of other terms indicative of receiving highly complex medical treatments, many times with minimal odds of getting better. Although, there is practically no way for us to partake in this messy frequent-flyer market, what if we could shrink its size and simultaneously expand the much nicer healthy market? What if we could blow the Pareto principle to smithereens and reduce medical spending on the sick from 80% to say 50%? That would free almost $1 trillion dollars per year, just waiting to be disruptively innovated into our accounts receivable, by selling something to the 80% that need little to no professional medical care. Keep in mind that the nation is only expecting to slow the growth of health care expenditures, or to “bend the curve”, not to actually reduce the amount of money it spends on health care. The $3 trillion will be there year after year for us to enjoy. We just need to come up with a smarter allocation of resources. Unfortunately, it looks like other innovative folks are having the same epiphany, so we will have to share the bounty and engage in some serious team work. The two pronged approach consists of prying the money out of the clenched fists of doctors who provide medical services to the 20%, and of using a few non-practicing physicians to legitimize increased reallocation of expenses to the 80%. In other words, we move from a sick care system to a health system, while delegating the care portion to involuntary labor performed by the sick 20% who have the most skin in the game. I think old John D. would be proud. The first order of business is to obtain support from the government because although we are not a socialist country, the government controls and regulates most of our $3 trillion play money. Check. The second step is to put those high spenders on a budget without seeming heartless or criminal. The best way to do that is to budget indirectly. Instead of going to each sick person and telling them that we will not spend more than say, $100,000 on you this year, we make their doctor an offer she can’t refuse. Here is $100, 000 dollars for this particular frequent-flyer. If it ends up costing more, it comes out of your paycheck. If it ends up costing less, you get a cool sticker. Doctors went to medical school, not business school, so we may get that deer in the headlights look when we make our offer, which is where our opportunity begins to emerge. We are business people and we know how to budget and allocate resources, so we can share with you methodologies that worked for the banks, for Toyota, for Starbucks, for the Cheesecake Factory and myriad other successful businesses. And we can share technology tools to make you successful, doctor. Of course, this is America, and we need to be successful too, so there is a fee for this cache of wisdom and intelligent software. Not to worry though, we’ll show you how to factor it into your allotted $100,000 and spread it over your entire client population. It’s not like it’s coming out of your pocket, you know. Team work means that we have to keep hospital systems happy too. Many of them are heavily invested in all sorts of construction projects and machinery. If we cap the spending on the most lucrative 20%, hospitals will fight us tooth and nail, and unlike little doctors, these guys are no deer in our headlights, so we need to think outside the box. To get the best hospitals to join our winning team, we promise to obliterate the competition and funnel all customers to a handful of centers of excellence, while at the same time we allow them to raise unit prices per service. The net result for each team player is that revenues go up slightly, while profits go up significantly, as volume of expensive services drops like a rock. And in return for our innovative counseling and enabling tools, we take a piece of that action as well. Finally, we take stock of our capabilities to identify stuff we can sell for approximately $1 trillion per year to please the 80% who are basically healthy. We know how to do social media, mobile apps, targeted marketing, data processing, telecommunications and retail. Our go to market plan is crystallizing before our eyes. Social health, mobile health, health surveillance, health data, telehealth, Apple Health, CVS Health, Google Health, basically we just slap health before or after our existing line of products. Not a word about sickness because the 80% want to be healthy, and we are selling health. If we get lucky, even the 20% may be persuaded to see the value of curative hope in a cell phone. For the sake of completeness our plan should explore the largely historical bumps in the road, such as the Food and Drug Administration (FDA) and its antiquated insistence on regulating medical things. 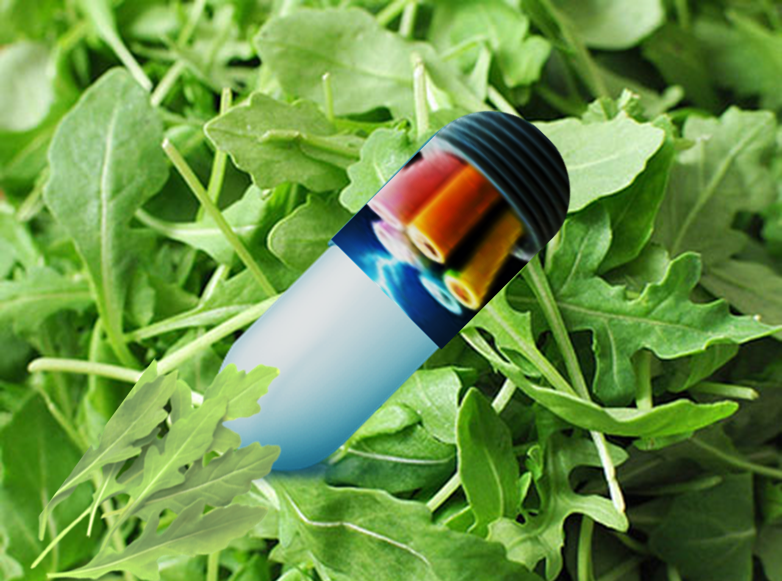 That was fine and dandy for the sick market, but in the innovative health market, everybody is already healthy so efficacy and safety are misplaced notions for wellness vaporware. To solidify our clinical standing, we should come up with some clinically sounding products as well, and impress upon the healthy 80% that every self-respecting billionaire is already using these health enhancing things on a regular basis, whether it’s Tim Cook who can’t live without his new watch, or Mark Cuban who can’t go more than three months without self-inflicted bloodwork (or a little free publicity on Twitter). This does sound like taking candy from a baby, because it is. Traditional health care did not behave much like a market, but health is a classic consumer market and we are the champs when it comes to selling cheap stuff to consumers, or selling consumers to manufacturers of cheap stuff. The now discretionary $1 trillion is just the beginning, you see. The half trillion or so, previously spent on the healthy 80% is also up for grabs, because we don’t need doctors to sell that stuff. And once we get our foot in the door, we can chip away at the remaining $1.5 trillion wasted on the sick as well. To whet your appetite, here’s a billion dollar idea to leverage community resources: nudge the chronically unemployed to provide free care to the chronically ill, in the comfort of their artificially intelligent homes.